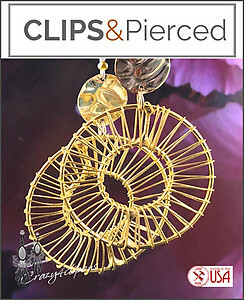 Features: Wired crazy clip hoop earrings! Yes, these are dramatic and bold, they are shiny and very light. These earrings are not for the faint of heart. They are dramatic and, hmmm, loud :) --- Perfect for those who like unique and bold accessories. Available in pierced and clip. Hoop Earrings are always a great accessory for every day wear.